With ImageIR® 9300 Z, InfraTec presents a sophisticated long range infrared camera system in combination with an incredibly powerful zoom lens. 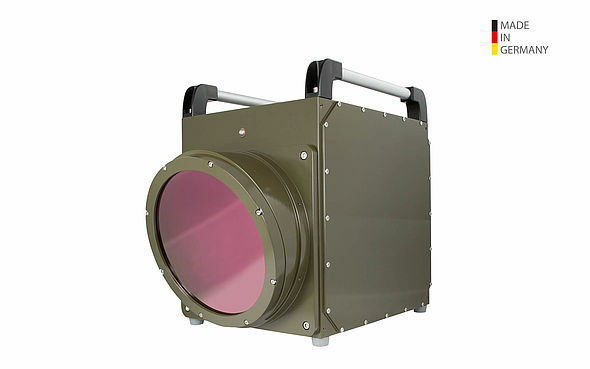 State-of-the-art InSb detector technology with a resolution of (1,280 × 1,024) IR pixels offers sensitive, high-resolution imaging capacity for 24/7 operation even through fog, smoke, day and night. Frame rates of up to 100 Hz make this camera capable of supporting demanding imaging, tracking and monitoring tasks. With an outstanding detection range, vehicles can be detected up to 18 km and persons up to 15 km. The rugged and exact power zoom together with the high-performance 30× zoom lens allows for a continuously adjustable field of view from (39.8 × 32.3)° down to (1.3 × 1.0)° with a detector format of (1,280 × 1,024) IR pixels, allowing far away objects to be displayed with a high-resolution infrared image. The customizable software interface offers time coded real-time playback.